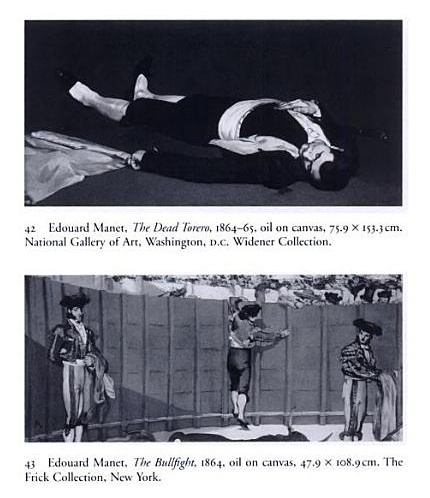 In 1864 Manet exhibited a large painting he called Episode from a Bullfight. Critics complained that its image of a fallen matador was out of proportion to the bull that had just gored him. "A wooden bullfighter, killed by a horned rat," one sneered. At some point, Manet cut the painting apart, creating two smaller, more powerful works: The Dead Toreador, here, and The Bullfight, now in the Frick Collection, New York. Although Manet may have acted in response to the harsh criticism, it was not uncommon for him to rework compositions. He repainted the background, extracting the figure from the context of the bullfight, and in so doing changed the nature of his painting. The fallen matador is no longer part of a narrative but is instead an icon, an isolated and compelling figure of sudden and violent death. From the now featureless background the man's body is dramatically foreshortened, thrusting toward the viewer. Its proximity and isolation are startling. Only the man's costume informs us about him, traces of blood the only signs of a painful death. Manet's choice of a Spanish subject—he did many early in his career—reflects his interest in the seventeenth-century painter Velázquez, as does the dramatic organization of the composition and his palette of rich, dark tones.